Applied Vision (AVC), a leading provider of machine vision inspection systems for the container manufacturing industry, announced a 48 per cent increase in sales for 2007. Building on the success of last year's move to the new Stuttgart Trade Fair Centre, Vision 2008 promises a 25 per cent increase in floor space over 2007's event. Don Cochran, chairman and CEO of Pressco Technology, was presented with the 2008 Automated Imaging Achievement Award during a ceremony held at the Automated Imaging Association's (AIA) 16th Annual Business Conference in Orlando, Florida. NAC Image Technology has appointed Kent Peterson as regional sales manager for NAC High-Speed Imaging Systems in the states of Wisconsin, Minnesota, North and South Dakota, Iowa, Nebraska, Kansas, Missouri, and Illinois. Firstsight Vision director Mark Williamson has joined the committee of the Institute of Engineering and Technology's Visual Information Engineering technical and professional network (TPN). Vision Components has sponsored the Hands on Technology society, which runs the First Lego League robot competition in Germany. The Automated Imaging Association (AIA) will again participate in an International Pavillion at the China International Machine Vision Exhibition, to be held on 20-22 March 2008. The Vision Show, North America's largest machine vision trade show and conference, will return to the Hynes Convention Centre in Boston, 10-12 June 2008. 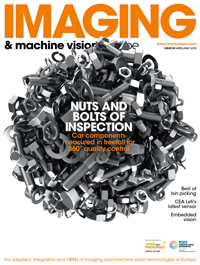 Michael Cyros, president of Allied Vision Technologies, has been elected 2008 president of the Automated Imaging Association (AIA). He succeeds John Merva, vice president of business development at CCS America, who served for three years as president and remains on the board.